A new full-length documentary film on the Divine Mercy is now available for large or small screenings during the Jubilee Year of Mercy. It has the long and intriguing title of: The Original Image of Divine Mercy: The Untold Story of An Unknown Masterpiece. And, if you do not take a shine to most or all of the images of the Divine Mercy you have encountered? That’s because you probably have not encountered the original image. What is “The Divine Mercy” Devotion? If you are one of the .0001% of Catholics who have never heard of the Divine Mercy devotion (non-Catholics are completely absolved), it is simply this: Jesus appeared to a young Polish nun living in Lithuania in the 1930’s (Sr. Faustina is now “St. Faustina”) and revealed His desire that an image of His Divine Mercy should be promulgated throughout the world, with the words “Jesus, I trust in You” beneath. This “devotion” is to be accompanied by prayers to/for divine mercy and acts of mercy. A book with the words of Jesus as recorded by St. Faustina: The Diary of St. Maria Faustina Kowalska: Divine Mercy in My Soul is available in many languages. Countless numbers of people now pray “The Divine Mercy chaplet” (prayed on regular rosary beads) and “The Divine Mercy Novena.” Prayers to the Divine Mercy are especially prayed every day at 3 pm, the “hour of mercy” when Christ died. Jesus told Sr. Faustina to paint an image exactly as he appeared to her. She was no painter, so she and her spiritual director, Fr. Michael Sopocko, enlisted the help of an artist, Mr. Kazimirowski, who labored to get the details just right (and of course, Sr. Faustina was never satisfied, even with the final product, but she came to accept the fact that no artist could ever fully capture Jesus the way she saw Him). A highlight and constant of the film is the parallel story of the fierce persecution of the Catholic Church in Lithuania under the Soviets after World War II. Those of us old enough to remember the days of the former U.S.S.R. heard plenty of stories as it was happening: the beginning of the fall of the Soviet Union was 1989. The famous (infamous to the Communists) “Hill of Crosses” is also briefly featured in the documentary. Most poignant of all is the subdued pain in the faces and voices of the elderly bishops and priests (some of whom did forced labor in Siberian work camps). The story of the heroism of the persecuted Church under Soviet rule is a story yet to be told (actually many, many stories to be told). The Church had to be crushed because its doctrines were the polar opposite of atheistic Communism. But Isn’t the Divine Mercy Devotion from Poland? So why have we thought the Divine Mercy devotion was from Poland? Many Poles live in Lithuania, and there was even a Polish-Lithuanian Commonwealth in the 18th century, under common rule. Sr. Faustina was Polish, and under the Soviets, each country absorbed into the U.S.S.R still had strict borders (though these borders were not shown on many world maps of the time) that could not be easily traversed. Just as the image of the Divine Mercy began to spread from Lithuania, World War II hit, and Poland became prominent in furthering the devotion. However, Polish artists, one in particular, began doing their own altered versions of the original image, and these became associated as “the” image. There is a movement today toward restoring the original image to prominence. After being: forgotten, abandoned, ignored, secretly venerated, sold for a bottle of vodka, kept in a priest’s private residence, on vacation in Belarus and heisted by some daring nuns, the original image is now enthroned above the main altar of the Church of the Holy Spirit (where Fr. Sopocko once served) in Vilnius, Lithuania. The documentary unassumingly features Jim Gaffigan, Harry Connick, Jr., Bishop Barron, three Cardinals, a slew of Bishops, priests, art and church historians (lots of women here), and those who were witnesses to the image’s sojourn. These articulate folks and the entire film have a lot to say, not just about this particular image, but the role of images in our Faith in general. “Sacred icons are primarily mediums of grace.” But, if you still don’t care for the portrayal of the original image “…the image is not the object of our devotion anyway.” Jesus said it’s all about His grace and mercy, not the particular color or beauty of the painting. A warm, personal theology exudes from this entire project. If you’ve ever given up on theology as dry, aloof, clinical, hard, cold and abstract? This film will be a fragrant balm. This is serious, profound, lived, battle-scarred, Eastern European Christianity, people. This documentary is an image of the image, in a sense. How are its production values? The Original Image of Divine Mercy is a contemporarily contemplative film. Cooler-than-thou acoustic guitar, the vocals of Mike Mangione and an Audrey Assad soundalike grace our ponderings. Natural lighting floating in from a window. A fondness for handheld filming. A flowing fluidity to the camerawork . No boring sit-down interviews here. Most interviewees stand in their own environment or an ambience of the original image. Mostly mid-range shots and hardly any close-ups situate us in a “this is bigger than all of us and involves all of us” frame of mind. There’s a connectedness with the surroundings, including the filmmakers who are very often in the shots. It has an immediate, “you are there” feel which doesn’t allow us to be passive bystanders. The camerawork can be raw, but with a purpose. The interviews can be long, but not unedited. The filmmakers are letting people have their say, the way they want to say it, clarifying here and there with a translator. It’s all captured because — like the very image of Divine Mercy — it’s not perfection we’re after. After each segment of interviews, we take a break and see the Divine Mercy image doing its thing around the world in public places. We see the interviewees relaxing, preparing, meditating before the image, interacting with the filmmakers in candid shots. At first I thought: there’s too many “behind the scenes,” but then I realized these are not behind the scenes at all. A sense of real life and not “show” is communicated effectively. Two pleasing devices: uniformly stylized paintings of the interviewees , as well as stills of quotes from Sr. Faustina’s Diary with a Polish-accented female voice-over, tie the narrative together. Some misspellings and sloppy punctuation in the subtitles (but not horrible) — will be corrected in DVD release in November. What the filmmakers have created is an artistic, oral/visual historical document. 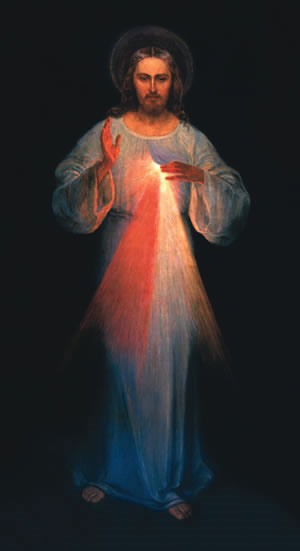 I really can’t abide any of the images of the Divine Mercy I’ve seen (unless they’ve slapped the face of the Sacred Heart of Jesus from Hales Corner, Wisconsin, on it, but then it also looks tacky), but this original image is realistic, natural, normal, approachable. I think you’ll like it, too. Take heart if you don’t “get” the Divine Mercy devotion. It took Sr. Faustina’s own spiritual director time to comprehend it (and at least one other prominent person in the film admits to the same). This film concretizes the development of the devotion and the physical and spiritual journey of the image itself, as it spread throughout the world. And, as an interviewee sums up at the end: the journey isn’t over.